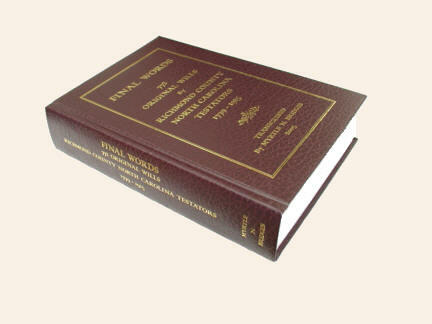 Each remaining FINAL WORDS has been marked down from $60 to $40. !!! study of all available resources needs to be made to determine the exact relationship to the testator. lifetime. Sometimes they were found living near their parents, with families of their own. Horry, SC; 1905-James T. Bradley, Anson Co., NC; 1900-Berry Bryant, Scotland Co., NC; 1886-Catherine P.
Co., GA; 1912-Alice M. Webster, Cabarrus Co., NC; and 1911-J. H. Stewart, Mocksville, NC. wills providing additional valuable information. individual names. This is a perfect companion book for Richmond County Estate Books,I, II & III - Adams-Yoe. Go To BUYERS COMMENTS PAGE FOR "FINAL WORDS"